Subhan, M., Chandra Saha, P., Uddin, N., Sarker, P. (2017). Synthesis, Structure, Spectroscopy and Photocatalytic Studies of Nano Multi-Metal Oxide MgO∙Al2O3∙ZnO and MgO∙Al2O3∙ZnO-Curcumin Composite. 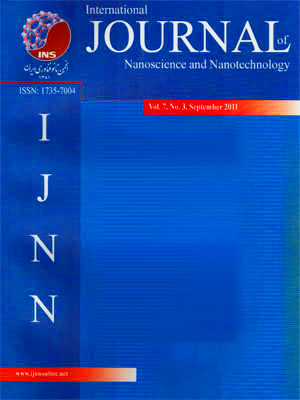 International Journal of Nanoscience and Nanotechnology, 13(1), 69-82. Md Abdus Subhan; Pallab Chandra Saha; Nizam Uddin; Prosenjit Sarker. "Synthesis, Structure, Spectroscopy and Photocatalytic Studies of Nano Multi-Metal Oxide MgO∙Al2O3∙ZnO and MgO∙Al2O3∙ZnO-Curcumin Composite". International Journal of Nanoscience and Nanotechnology, 13, 1, 2017, 69-82. Subhan, M., Chandra Saha, P., Uddin, N., Sarker, P. (2017). 'Synthesis, Structure, Spectroscopy and Photocatalytic Studies of Nano Multi-Metal Oxide MgO∙Al2O3∙ZnO and MgO∙Al2O3∙ZnO-Curcumin Composite', International Journal of Nanoscience and Nanotechnology, 13(1), pp. 69-82. Subhan, M., Chandra Saha, P., Uddin, N., Sarker, P. Synthesis, Structure, Spectroscopy and Photocatalytic Studies of Nano Multi-Metal Oxide MgO∙Al2O3∙ZnO and MgO∙Al2O3∙ZnO-Curcumin Composite. International Journal of Nanoscience and Nanotechnology, 2017; 13(1): 69-82. The mixed metal nanocomposite MgO∙Al2O3∙ZnO has been prepared by coprecipitation method. The product was characterized by XRD. The average particle size was found to be 34.89 nm from XRD data. SEM and SEM-EDS were studied for evaluating surface morphology and elemental composition. The FTIR spectrum of prepared mixed metal nanocomposites MgO∙Al2O3∙ZnO and MgO∙Al2O3∙ZnO-curcumin were studied. The optical properties of the nanocomposites were studied by PL (Photoluminescence). The quantum efficiency (Φ) of MgO∙Al2O3∙ZnO and MgO∙Al2O3∙ZnO-curcumin was found to be 0.86 and 0.31, respectively in acetone. The photocatalytic activity of the nano composite, MgO∙Al2O3∙ZnO was investigated over methyl violet 6b (MV) dye under UV-Visible light irradiation. The photocatalytic activity was assessed with various parameters including variation of pH, effect of H2O2 and reusability. The dye degradation efficiency of nanocomposite was observed to be 48.7% and 93.42% for catalyst and catalyst with H2O2 at pH 9. The efficiency was 86.96% for catalyst with H2O2 at pH 7. WangX. K., ChenG. H. and GuoW. L., (2003). “Sonochemical Degradation Kinetics of Methyl Violet in Aqueous Solutions”Molecules., 8: 40.